"The Himalayan pilgrimages are the oldest organized travel system, evolved over time by Hindu sages and embodying the spirit of wander, adventure and spirituality"
Shiva, in the form of a lingam, is formed naturally of an ice - stalagmite One of the holy trinity, Shiva is a living god. The most ancient and sacred book of India, the Rig Veda evokes his presence in its hymns. Vedic myths, ritual and even astronomy testify to his existence from the dawn of time. Shiva is known to have made his home in the Himalayas. He built no house nor shelter, not for himself or his bride. He was an ascetic, and yet married; he could be both for "he was the wild god sporting in the forest or taking his ease on a cloud." Legend has it that Shiva recounted to Parvati the secret of creation in the Amarnathji cave. Unknown to them, a pair of mating pigeons eavesdropped on this conversation and having learned the secret, are reborn again and again, and have made the cave their eternal abode. Many pilgrims report seeing the pigeons-pair when they trek the arduous route to pay obeisance before the ice-lingam (the phallic symbol of Shiva). The trek to Amarnathji, in the month of Shravan (July - August) has the devout flock to this incredible shrine, where the image of Shiva, in the form of a lingam, is formed naturally of an ice - stalagmite, and which waxes and wanes with the moon. By its side are, fascinatingly, two more ice - lingams, that of Parvati and of their son, Ganesha. According to an ancient tale, there was once a Muslim shepherd named Buta Malik who was given a sack of coal by a sadhu. Upon reaching home he discovered that the sack, in fact, contained gold. Overjoyed and overcome, Buta Malik rushed back to look for the sadhu and thank him, but on the spot of their meeting discovered a cave, and eventually this became a place of pilgrimage for all believers. To date, a percentage of the donations made by pilgrims are given to the descendants of Malik, and the remaining to the trust which manages the shrine. Yet another legend has it that when Kashap Reshi drained the Kashmir valley of water (it was believed to have been a vast lake), the cave and the lingam were discovered by Bregish Reshi who was travelling the Himalayas. When people heard of the lingam, Amarnathji for them became Shiva's abode and a centre of pilgrimage. Whatever the legends and the history of Amarnathji's discovery, it is today a very important centre of pilgrimage and though the route is as difficult to negotiate as it is exciting, every year, thousands of devotees come to pay homage before Shiva in one of his famous Himalayan abodes. Situated in a narrow gorge at the farther end of Lidder valley, Amarnathji stands at 3,888 m and is 45 km from Pahalgam and 141 km from Srinagar. Though the original pilgrimage subscribes that the yatra be undertaken from Srinagar, the more common practice is to begin the journey from Pahalgam, and cover the distance to Amarnathji and back in four or five days. Pahalgam is 96 km from Srinagar. Since the base point for the pilgrim's trek is picturesque Pahalgam, a large tented township springs up to accommodate the pilgrims. All intermediate halting places have the same kind of facilities as are provided at Pahalgam, and a Yatra Officer is appointed to conduct the pilgrimage. "For those who journey with faith, it is a rewarding experience, this simple visitation to a cave-shrine, the home of the Himalayan mendicant who is both destroyer and healer, the greatest of the Hindu God"
The trek from Pahalgam to Amarnathji cave is on an ancient peregrine route. The 45 - km distance is covered in four days, with night halts at Chandanwari, Sheshnag (Wawjan) and Panchtarni. The distance from Pahalgam to Chandanwari (16 km) is now covered by motor transport. The pilgrims camp here or at Pahalgam on the first night out. The first day's trek of 13 km from Chandanwari is through spectacular, primeval countryside. The main centre of attraction on this trek is Sheshnag, a mountain lake which derives its name from its seven peaks, resembling the heads of a mythical snake. The journey to Sheshnag follows steep inclines up the right bank of a cascading stream and wild scenery untouched by civilisation. The second night's camp at Wawjan overlooks the deep blue water of Sheshnag lake, and glaciers beyond it. The lake is also associated with legends of love and revenge, and at the camp these are recounted by campfires, to the stillness of a pine-scented, Himalayan night. The second day's 12 km trek steadily gains height, winding up across Mahagunas Pass at 4,600 m and then descending to the meadow - lands of Panchtarni, the last camp enroute to the holy cave. From Panchtarni to Amarnathji is only 6 km, but an early morning's start is recommended for there is a long queue awaiting entrance to the cave. The same day, following darshan, devotees can return to Panchtarni in time for lunch, and continue to Wawjan to spend the fourth night out; or continue further to Zojibal, returning to Pahalgam on the 4th day. Entrance to the cave is regulated, and darshan a hasty affair for there are many others waiting outside to pay homage before the awesome Shivalingam. 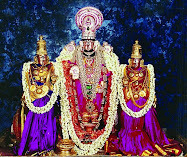 The devotees sing bhajans, chant incantations, and priests perform aarti and puja, invoking the blessing of Shiva, the divine, the pure, the absolute. Pilgrims are advised not to pay more than the specified rates for either services or their provisions. It is important to observe discipline on the trek and keep moving slowly and steadily. Adhere to the instructions issued by the Yatra Officer from time to time. Officials of the State Police, Health, Tourism, Food & Supplies and other concerned Departments are deployed on duty to help the pilgrims. You must also ensure that you are physically fit for the journey, and have yourself medically examined. Remember that you have to cross Mahagunus pass which is at an altitude of 14,000 feet above sea level. Please ensure that ponies carrying your luggage and eatables remain with you at all times. Also ensure that the Ponywalla, labourer or Dandiwalla is properly registered and carries a token. You can get these alloted at fixed rates at the base camps. Do not overstrain on steep gradients: do not relax at points where there are warning notices; don't break traffic discipline or try to overtake other on difficult stretches. Aged, infirm, ailing and insufficiently clothed persons will not be permitted to proceed beyond Pahalgam. 1. Please ensure that you are physically and mentally fit to perform thejourney as the Yatra involves trekking at an altitude of 14, 000 ft. Haveyourself medically examined and certified fit for the journey and forwardthe medical certificate to the registering authority designated fory our area of residence. 2. Do carry sufficient heavy woolens including sweaters, (full as well as half sleaved), drawers woolen trousers, gloves, monkey caps etc. other items to be carried include wind cheater, light rain coat, a sleeping bag orblankets or a set of bedding items water proof tent, a torch with sufficient batteries, a walking stick with proper hand grip. Ladies are advised not go on the journey in Saris, instead pants or salwar suits with drawers should be used. 3. Do carry some eatable like biscuits, candy, milk powder, sugar, assorted dry fruits, honey and some tinned food with you. Also carry water bottle, plastic plate, tumbler, Spoons, etc. 4. Ration and firewood quota has been especially arranged for you at all stations enroute, against payment. 5. Make sure that the ponywalla, the labourer, the dandywalla is properly registered and carries a token. You can get these allotted at fixed ratesby competent authority at the same camp. 6. Do ensure that ponies carrying your luggage and eatables etc. remain with you all time, if you let them ramain behind you are likely to be unnecessarily inconvenienced. 7. Do observe discipline on the trek and keep on moving slowly and steadily. Adhere to the instructions issued by the Yatra Officer from time to time. The officials of the Police, Tourism, Health, Food & Supplies and other Departments are there to help you to perform the journey comfortably. 8. Do carry sufficient money to pay your accommodation at Pehalgam and at other stations enroute to the Holy Cave and for meeting other personal requirements. 9. All medical facilities during the Yatra are free. However, do carry your personal medical kit also. 10. 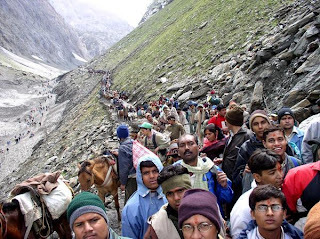 Carrying/use of alcohol enroute the Yatra is strictly prohibited. 1. Do not overstrain on steep gradients. 2. Do not relax at points where there are warning notices. 4. Do not pay more than the prices/rates fixed for porters, ponies, dandies, rations firewood, accommodation etc. Aged, infirm, ailing, and insufficiently clothed persons will not be permittedto proceed beyond Pehalgam. No Yatri will be allowed without aregistration card. The Yatra is organised by the Jammu & Kashmir Govt., in the month of Shravan, and commences mainly from Pahalgam on specified dates. In recent years the route from Baltal has also been thrown open for the pilgrims to approach the holy Cave. Dress: Pilgrims are advised to carry sufficient wollens such as sweaters, drawers, wollen trousers, monkey cap etc. Other items could include wind cheaters, rain coat, sleeping bag or blankets, umbrella, waterproof boots/shoes, walking stick, torch etc. Ladies are advised not to go on the trek in saris, instead pants or Salwar suits with drawers should be used. Medical Assistance: Medical posts manned by qualified doctors and nursing staff are established enroute to cater to the needs of the pilgrims, free of cost. However, pilgrims are advised to carry along any medicines specifically prescribed for them. Provisions: Essential rations are available at fair price rates from the specially established Govt. Depots at Chandanwari, Sheshnag and Panchtami, Numerous wayside tea-shops and small restaurants are set up by private parties. However, pilgrims are advised to carry with them biscuits, toffees, tinned food etc. to cater to their immediate needs. Firewood or gas can be obtained at Chandanwari, Sheshnag (Wawajan), Panchtami and near the Cave. Insurance: In view of the hazardous nature, pilgrims are advised to insure themselves before proceeding on the Yatra. •Please ensure that you are physically and mentally fit to perform the journey as the Yatra involves trekking at an altitude of 14, 000 ft. Have yourself medically examined and certified fit for the journey and forward the medical certificate to the registering authority designated for your area of residence. •Do carry sufficient heavy woolens including sweaters, (full as well as half sleaved), drawers woolen trousers, gloves, monkey caps etc. other items to be carried include wind cheater, light rain coat, a sleeping bag or blankets or a set of bedding items water proof tent, a torch with sufficient batteries, a walking stick with proper hand grip. Ladies are advised not go on the journey in Saris, instead pants or salwar suits with drawers should be used. •Do carry some eatable like biscuits, candy, milk powder, sugar, assorted dry fruits, honey and some tinned food with you. Also carry water bottle, plastic plate, tumbler, Spoons, etc. •Ration and firewood quota has been especially arranged for you at all stations enroute, against payment. •Make sure that the ponywalla, the labourer, the dandywalla is properly registered and carries a token. You can get these allotted at fixed rates by competent authority at the same camp. •Do ensure that ponies carrying your luggage and eatables etc. remain with you all time, if you let them ramain behind you are likely to be unnecessarily inconvenienced. •Do observe discipline on the trek and keep on moving slowly and steadily. Adhere to the instructions issued by the Yatra Officer from time to time. The officials of the Police, Tourism, Health, Food & Supplies and other Departments are there to help you to perform the journey comfortably. •Do carry sufficient money to pay your accommodation at Pehalgam and at other stations enroute to the Holy Cave and for meeting other personal requirements. •All medical facilities during the Yatra are free. However, do carry your personal medical kit also..
•Carrying/use of alcohol enroute the Yatra is strictly prohibited. •Do not overstrain on steep gradients. •Do not relax at points where there are warning notices. •Do not break traffic discipline or try to overtake others in difficult stretches of the route. Aged, infirm, ailing, and insufficiently clothed persons will not be permitted to proceed beyond Pehalgam. No Yatri will be allowed without a registration card. Accommodation: Good tented accommodation with allied facilities are set-up during the Yatra period. These are provided on the basis of payment of fixed rates. Registration: Registration of pilgrims are undertaken about a month ahead of the date fixed for commencement of Yatra. Though it is tough route still nearly one and a half lac pilgrims visit every year . The number of pilgrims is increasing every year. The journey from Jammu onward is by road and there are two routes . The details are given here. JAMMU - PAHALGAM - HOLY CAVE. It is 96 KM from Srinagar .This distance can be covered by car,bus or taxi. Pahalgam is known all over the world for its beauty. It is small town situated on the banks of Lidder River. It is surrounded by high mountains. All essentials can be bought here. Good Hotels are available for accommodation. However the arrangements for stay and Langar are also made by the Non Government Service Organisations. The distance from Pahalgam to Chandanwari is 16km. The route is good .It can be covered by road transport also. Mini buses are also available from Pahalgam to reach Chandanwari. The trail runs along the Lidder River . The route is scenic. Food is available here. Pilgrims camp at Pahalgam or Chandanwari on the first night . As the Yatra proceed further from Chandanwari one climbs a height to reach Pissu Top. It is said that to be first to reach for darshan of Bhole Nath Shivshankar there was a war between Devtas and Rakshas . With the power of Shiv , devtas could kill the rakshas in such large number that the heap of their dead bodies has resulted in this high mountain. This second day's trek of 12 kms from Chandanwari is through Pissu Top and spectacular, primeval countryside, and reaches Sheshnag - a mountain which derives its name from its Seven Peaks, resembling the heads of the mythical snake. The Journey to Sheshnag follows steep inclines on the right bank of a cascading stream and wild scenery untouched by civilisation. The second night's camp at Sheshnag overlooks the deep blue waters of Sheshnag lake, and glaciers beyond it. There are legends of love and revenge too associated with Sheshnag, and at the camp these are narrated by campfires . The stillness of a pine scented Himalayan night increases your inner joy. Yatris can take bath and get their fatigue alleviated. It is beautiful and scenic. From Sheshnag one has to climb steep height up across Mahagunas Pass at 4276 mtrs. (14000 ft) for 4.6 KM and then descending to the meadow lands of Panchtarni at a height of 3657 mtrs (12000 ft). The last camp enroute to the Holy Cave is made here on third day. Here one faces cold winds which cause the skin to crack . Hence cold cream / Vaseline are very useful for protection of skin. Some Yatris are also effected by deficiency of oxygen .Some may get the feeling of vomiting . So dry fruit like Allu Bukhara ,sour and sweet eatables like Lemon are useful to control these symptoms . The route to Mahagunas is full of rivulets , water falls , springs . Panchtarni is a very beautiful place in the feet of BHAIRAV MOUNT. Five Rivers flow here . It is said that the five rivers origanated from Lord Shiva's Hairs (Jataon). Pilgrims camp at Panchtarni on the 3rd night. 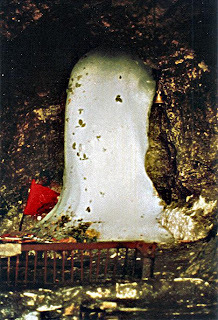 The Holy Cave of Shri Amarnath is only 6 kms from Panchtarni. As there is no place to stay hence the pilgrims start in the early hours of the morning after their stay at Panchtarni. On the way to The Holy Cave one comes across the Sangam of Amravati and Panchtarni. Some pilgrims take bath at Amravati near holy cave to become pious before going for Darshan. Near the cave is found white soil known as Bhasam. It is the most beloved soil of Shiv ji . The pilgrims apply this Holy soil to their body and then go for Shivlingam Darshan. There are two smaller Shivlings one of Maa Parvati and other of Shri Ganesh. It may be noted that after having early Darshan of the Shivlinga at Holy Cave one can return to Panchtarni well in time the same day . Some pilgrims camp at Panchtarni while others continue their journey and reach back Sheshnag by the same evening. JAMMU - Udhampur - Kud - Patnitop - Ramban - Banihal - KaziGund - Anantnag - Srinagar - Sonamarg - Baltal. The journey from Jammu to Baltal which is about 400 kms. is full of beautiful Sites and one can experience of being in Heaven , a Paradise on earth. Passing through beautiful valleys, steeped mountains, one is sure of forgetting , oneself as a person ,for a while . A thrill, which is obviously there in every pilgrim gets enhanced while passing through this way owing to the Darshan of Holy Cave. In nutshell, a journey which can go down to your memory throughout the lifetime. From Baltal Holy Cave is just 14 Kms. This distance can be covered by foot / Ponies. However, Dandies are also available for handicapped and old aged pilgrims. The width of the pebbled (kuchha) road is a bit narrow as compared to the Chandanwari-Holy Cave route, moreover , there are some steep rises & falls on the way , as compared to the Chandanwari route, but pilgrims can return back to base camp Baltal through this route only in one day. Wonderful information thak you my dear for sharing, Amarnath is one of the sacred place and most of devotes Book Amarnath Yatra tour packages and visit this amaranth cave and discover the beauty of Kashmir . Amarnath Yatra 2013is an ultimate opportunity to visit Kashmir paradise.